A rare mask represents a human-spirit transformation in the origin story of the Yagán people of Patagonia. 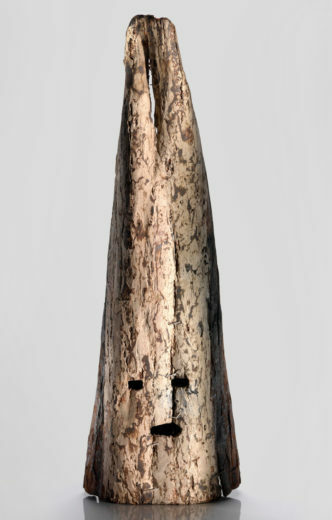 This compelling mask, constructed of bark and whale gut, is as much a mystery as it is a connection to the past. It was made by a Yagán artisan and was collected in 1924 on the shores of Tierra del Fuego, in southern Patagonia. (Also known as the Yaghan or Yámana, the Yagán are the southernmost indigenous people in the world.) With its faded stripes of red, white, and black pigment, the mask symbolizes the rainbow, one of the spiritual characters from the Yagán kina myth, and was used in their kina ceremony. The kina myth recalls a time when women maintained control over men by trickery, painting their faces and pretending to have supernatural powers. Once the men discovered that they had been deceived, they became angry and killed most of the women, sparing only a few of the very youngest. From then on, men held most of the power in Yagán society. The kina myth, for example, is also an origin story that helps explain the Yagán world. The murdered women transformed into the birds, fish, and other animals that populated the landscape. Elongate masks like this one represented the dozens of characters—both animals and spirits—in the myth. They included Hannuxa, the woman who turned into the Moon, and Löm, one of the men who led the killing, who transformed into the Sun. This mask represents Akainix, the man who became a rainbow. The masks were used in the physical manifestation of the kina myth, a multi-day coming-of-age ceremony for young men. The last kina ceremony took place in 1922, on the windswept shores of Beagle Channel, on the Chilean island of Navarino. Although European anthropologists Martin Gusinde and Wilhelm Koppers were in attendance, particular details on the ceremony had already been lost to time. By then, the Yagán population had been decimated by epidemics and no kina ceremony had taken place for nearly half a century. That ceremony was merely a partial re-enactment, conducted by the few remaining Yagán at Gusinde’s request. To curators and academics, masks such as this one are irreplaceable specimens from a culture on the brink of extinction. For Yagán descendants, however, they represent precious links that help strengthen ties to their ancestry. 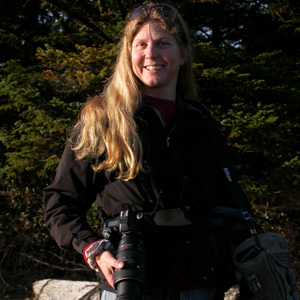 Jacqueline Windh is a freelance writer and photographer from Vancouver Island. With a PhD in geology as well as an MFA in creative writing, she has a flair for explaining scientific subjects with an engaging style. Her photos and articles have appeared in quality publications around the world, and her book The Wild Edge is a Canadian bestseller. She explores the planet by sea kayak and as an ultrarunner, and is a TEDx speaker. Cite this Article: Jacqueline Windh “The Man Who Became the Rainbow,” Hakai Magazine, Mar 11, 2016, accessed April 23rd, 2019, https://www.hakaimagazine.com/article-short/man-who-became-rainbow/.